Officially called Tatra 603-2 B5 Marathon.In the mid-sixties he plagued compete in the famous race in Marathon de la Route and attracted uproar unique ejector cooling.And thanks to the children of the original navigator and rider fascinates today. This “šestsettrojka” at first glance is not settled limousine that drove the Communist functionaries.Bright orange color, squatted outside the country, black hood.A rear unmistakable “trumpet”, which are the most visible part of the ejector cooling. Before some fifty years ago this car from Kopřivnice factory broke the opponents in European endurance races that lasted several days.At the wheel steering wheel three masters: Adolf Veřmiřovský, Alois Mark and Stanislav Hajdušek.The latter Kopřivnice worked as a test driver.And his sons with “dad’s” Tatra racing today.Among other things, it will present this weekend at the Brno Masaryk Circuit. Orange specimen was built in Koprivnice for the season 1967. “Šestsettrojky” he had belonged to the famous Marathon de la Route, čtyřiaosmdesátihodinovém endurance race, which rode on the legendary northern loop of the Nürburgring, the esteemed opponent. “In 1965, when he rode Tatras for the first time, they finished first and second in their category, finished one car.A year later, the Tatra first, second and third, “calculates Stanislav Hajdušek junior, fresh sixties and former extra league hockey player who competes today with the car for pleasure. This orange Tatra just flown trio Veřmiřovský-Mark-Hajdušek then in 1967 finished the race in third place in his class and fourth overall.In autumn the then still he presented on circuit races in Brno and at Rallye Sumava.And then it was a successful racing Tatra project completed. When Hajdušek junior brothers in the nineties decided to try dad Tatras find and put together, they had a difficult task.After completion of the racing project because all the machines back into production or factory rebuilt into a civilian car that was included in the regular service.”We rode in Prague at the ministry, while others ended up in an agricultural cooperative in the Bruntal.Only one race remained the engine used in the testing of motorway traffic, “recounted Stanislav Hajdušek. Searching in archives and registry vehicle eventually found Hajduškovi Tatra – immobile, just ten kilometers from Kopřivnice in the garden in the grass.He owned the widow of the last owner and did not know what to do with it.”So we agreed with her that she put decent for Tatra wheeled Skoda hundred,” says Hajdušek. 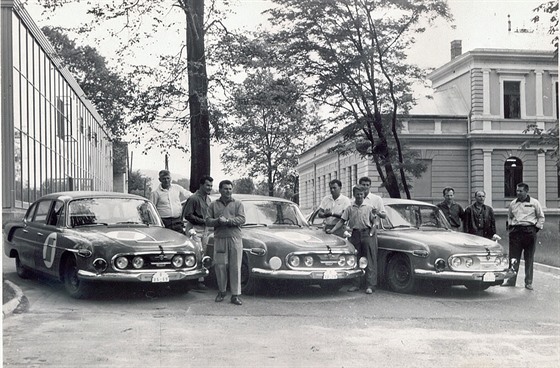 Three racing Tatras before leaving for the Marathon de la Route 1967. All the cars were orange, to distinguish them was the color of the mask. Renovation lasted a relatively short time – less than two years.In the mid 90s there was another time, veterans were far from such business.”Back then it was a pleasure to do it.She lived a lot of witnesses and everyone we love to help with that.Only one engine specialists, which we adjusted the carburetors Weber, the threw a blanket over himself, not to see what he does, “laughs Hajdušek. Restoration of cars had also had “therapeutic effect”.Hajdušek senior was seriously ill and he says his son, he wanted to die.Construction of car he should return zest for life.”With the Tatra, we brought him to other thoughts.We had him in the garage as such officer memorial, “he says today, sixty Hajdušek junior.The therapy worked.Former test pilot Tatry Hajdušek lived for 83 years, died three years ago. A renovated drove his Tatra truck?”I know that, yes, drove up.But then he got out and said: “Gentlemen, what I will not give a damn.The clutch is not prošlápnout, rigid brake, the steering wheel does not tighten.It’s hard.How can you ride, “says Hajdušek. 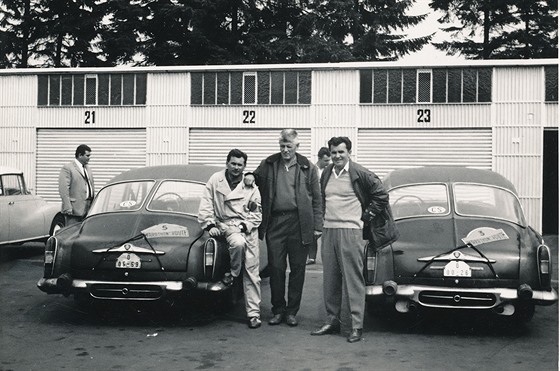 Today the crew of Tatra formed in 1967 (from left) Mark Alois, Adolf Veřmiřovský and Stanislav Hajdušek senior. With that hardness had Hajdušek senior truth, his son openly admits.Today renovated Tatra is still from the original lot different.Marathon races because then looked different than today’s automotive competition.Competitors got home in the car, crossed half of Europe, where for three days and three nights of racing and went back home.The car had to be built on such a scheme, the chassis was therefore much more comfortable mood. 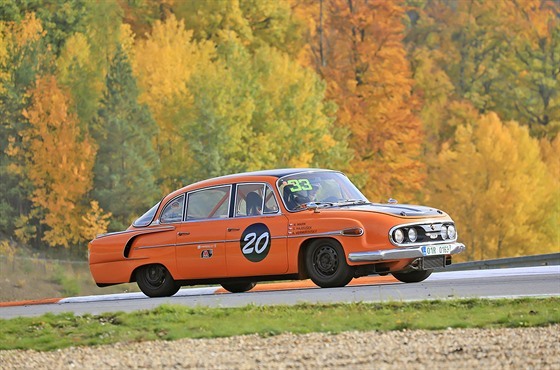 Tatra 603-2 B5 Marathon will be one of more than a hundred historic sports cars that will be presented at the Masaryk circuit in Brno this weekend May 7 to 8.The Brno race track hosts the Austrian Histo CUP, Czech Penrite Cup Classic Cup and drive formulas Czechoslovak Club F3. And the differences are, of course, the safety regulations.”Back then, racing overalls formed tesilky blue, white shirts, shoes and leather gloves without fingers,” says Hajdušek.And it emphasizes that it is definitely not thinking hyperbole.In order to Tatra could race today, of course, they must have complete safety equipment.The car must roll cage must have an emergency battery master switch.It is a tax for that marathon Tatra can still compete for real.Otherwise it could happen except in a museum. On the contrary, these “trumpets”, which will attract at first glance, his most famous car in the race stints have not.What they actually are?With lots of other improvements under the hood consists of an ejector cooling system.This creates a negative pressure while driving and the engine compartment then faster air flows.The motor then uchladí without otherwise conventional fans that add weight to the car and detract from engine performance. Thanks ejektorovému engine cooling fans may not have to detract from his 20 horses. To put the numbers: an ejector Tatra had about 170 horses, with some fans 150. That was not the competitors at the Marathon de la Route no avail.A side effect is ejectors – politely put – a very distinctive sound speech.Such that even in tolerant sixties was skousnutelný. “Even without the engine noise generators exceeds 105 decibels.When she went after Norschleife Tatra, knew all the villagers kilometers away, “laughs Hajdušek.For comparison – the noise of a hundred decibels issued a jackhammer.Formula 1 in its heyday had 145 decibels. The highlight of a career rebirth “šestsettrojky” was not yet famous Goodwood Revival Festival.Organizers there marathon Tatra wanted, but it was one small problem.He did not fit into the rules.According to it, they laugh at Goodwood to drive only cars produced before 1960. Conceptually, there šestsettrojka belongs, is produced since 1956, but this piece was apparently later. John Haugland, who as a former pilot Skoda Rally participation Tatra contended, finally Hajduškům suggested, be adjusted to mask the car version in 1960. “Paradoxically, this did not bother them.Brother took the gnashing of teeth cutter and an ancestor we remade the oval version with three lights.And as we came back from Goodwood again we rebuilt it back, “says Stanislav Hajdušek junior. However, for the feeling to participate in the most famous “revival” of the world it was worth.Commotion aroused course mainly ejectors.”They went there for us witnesses of the war and said that he Tatra goes, it sounds like flying a Spitfire,” recalls racer. 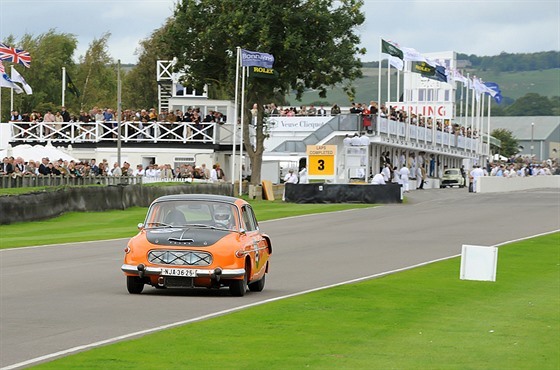 At the famous Goodwood Festival helped marathon Tatra John Haughland.Only it was necessary to rebuild the entire car to the older “three-eyed” version. It was just tiring always someone explain how the ejector cooling functions.”We ended up hurting mouth so that we were painted with a sketch explaining how and someone asked, we just wordlessly pointed to the paper,” he laughs. To Goodwood Tatra returned three times.And every time she graduated before leaving for reconstruction, “three-eyed” and after returning back to “four-eyed”.Leave your car in the version for Goodwood said he would be in the Czech Republic failed.”Here people know these cars.The first bit of informed Tatrovaks would send us to hell, “he laughs Hajdušek.